Luxury swimwear brand Vilebrequin has unveiled a limited edition design of its popular swimshorts in aid of sea life charity Te Mana O Te Moana. Meaning ‘The Sprit of the Ocean’ in Tahitian, French Polynesian charity Te Mana O Te Moana was set up by Cecile Gaspar more than a decade ago to protect the future of sea turtles. The charity is named for her very first patient, a green turtle that was rescued from the waters off Bora Bora but, sadly, after two months of intensive treatment did not survive. 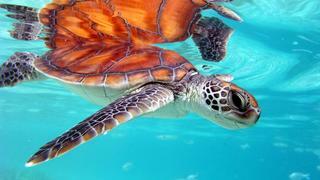 Since then more 400 turtles have received treatment in the lagoon of the Hotel InterContinental Moorea where the clinic is now located. Of these, almost half have been released back into their natural habitat and the clinic has become a pioneering centre for research and education into the plight of sea turtles. 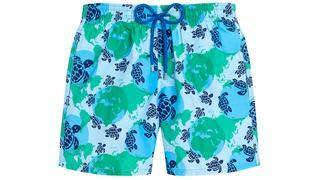 Vilebrequin’s partnership with the charity has seen the brand design a special edition swimshort printed with stylised sea turtles and images of the earth in matching sizes for fathers and sons. $10 from the sale of each pair will go directly to the charity. Vilebrequin has also pledged to help finance the day-to-day running of the clinic along with funding the development of education programmes for the local community. These schemes are vital for the survival of future generations of sea turtles as it is often the activity of local fisherman that unwittingly puts turtles at risk. Along with pollution and plastic debris, unregulated fishing is regarded as one of the biggest threats to the world’s oceans. However, by taking this step Vilebrequin will join the likes of G-Star Raw and Selfridge’s as one of the top fashion brands helping save the oceans. The Vilebrequin limited edition swimshort will be available from March 2016 with prices starting at £80.